Digitalization has led to an increase in electronic government services and democratic developments. One crucial aspect in the context of e-government for democracies consists of e-voting systems, which enable citizens to vote electronically. The Swiss government recently decided on the nationwide introduction of e-voting systems. One target group, which could particularly benefit from the introduction of e-voting systems, are Swiss nationals living abroad. However, the introduction of e-voting systems entails costs, thus an estimation of the willingness of Swiss nationals abroad to make use of the possibility of voting electronically is central to the introduction of e-voting systems. In November 2017, 596 Swiss citizens living abroad completed a questionnaire addressing their experience with and assessment of e-voting systems. Results yield a very high willingness to use e-voting among the respondents. Swiss nationals living abroad seem to perceive e-voting as being very useful and efficient. In addition, the findings show that concerns about data security seem to be of high importance for potential users of e-voting systems. Over the last decade, digitalization in general and e-government, including the provision of e-services in detail, became an increasingly important issue for the public sector (see e.g. Andersen, Medaglia, Vatrapu, Henriksen & Gauld 2011; Carter & Bélanger 2005; Cordella & Bonina 2012; Kim, Pan & Pan 2007). Kim et al. (2007: 512) state that “[g]overnments’ investments in public sector information systems have generally been directed towards enhancing efficiency and policy effectiveness as well as achieving broader democratic value.” Concerning the latter aspect, namely the democratic value, one crucial issue arising along with e-government and digitalization development is e-voting. The possibility for voters to cast their votes electronically in elections has been gaining increasing international attention in politics and administration over the last decade (cf. Buchstein 2001; Gibson, Krimmer, Teague & Pomares 2016; Moynihan 2004; Ondrisek 2009). Electronic voting, known as e-voting, represents an aspect of so-called e-democracy, which can be understood as an umbrella term for all processes of political decision-making using Information and Communication Technologies (ICT) (Breindl & Francq 2008: 15). In Switzerland, electronic voting was introduced in individual cantons for federal votes in 2004 (Federal Chancellery FCh 2018b). The expected advantages for the federal government through the introduction of e-voting are manifold and range from a faster determination of voting results to a more autonomous exercise of the political rights of voters with special needs, for example due to a disability (Federal Chancellery FCh 2018a). Against the background of an increasing relevance and provision of electronic services in the public sector (Andersen et al. 2011), the relevance of e-voting can analogously be assumed to increase over the next years. The topicality of e-voting is also reflected in the fact that the Federal Council is currently planning a comprehensive introduction of electronic voting in Switzerland (Federal Chancellery FCh 2018b). One target group that could particularly benefit from the introduction of e-voting are Swiss nationals living abroad (SNA) (cf. Braun, Buchsbaum, Krimmer & Prosser 2004). Although SNA do not represent a constituency of their own, but have to register themselves with a municipality of their home country or former place of residence, they are a steadily increasing target group for e-voting (Braun et al. 2004: 8). The number of Swiss nationals living abroad rose from 504,177 to 774,923 between 1993 and 2016, which corresponds to an increase of 54%. Transferred to the country’s total population, around 11% of the Swiss population is currently living abroad (FSO 2018). Given the increasing importance of the target group of Swiss nationals living abroad, they are of particular importance in the discussion about the introduction of e-voting. Since the introduction of e-voting systems entails costs, an estimation of the willingness of Swiss nationals abroad to make use of the possibility of voting electronically is central to the introduction of e-voting systems. Or, to quote Carter and Bélanger (2005: 6), “[t]he success and acceptance of e-government initiatives, such as online voting and licence renewal, are contingent upon citizens’ willingness to adopt these services”. The aim of the study is therefore to examine the attitudes and willingness of Swiss nationals living abroad to vote electronically. In addition, the study is intended to serve as an “inventory” in order to be able to make statements about how widespread the possibility of voting electronically is among Swiss nationals living abroad. Using the Technology Acceptance Model (TAM) as a theoretical foundation, the research questions of this paper are as follows: Is there a demand among Swiss nationals living abroad for the use of an e-voting system? What experiences do Swiss nationals living abroad have with e-voting? Which factors are correlated with the willingness of Swiss nationals abroad to use e-voting? The data is based on an online survey of Swiss nationals living abroad in November 2017. The data set comprises a total of 596 respondents.1 The results yield a high level of willingness among Swiss nationals living abroad to use e-voting, which varies according to socio-demographic characteristics. Moreover, findings indicate that the willingness to make use of e-voting systems is influenced by the perceived usefulness and institutional confidence. The study serves as an investigation of the evaluation of e-voting from potential users’ perspectives. The findings of this study can be directly applied to political practice, assisting in the process of the nationwide introduction of e-voting. More precisely, the results allow drawing conclusions regarding the determinants of the willingness to use e-voting systems among Swiss nationals living abroad. In the following paragraphs, the theoretical framework of this paper is presented by first providing information on the current use of e-voting systems in Switzerland, before deriving factors, which are assumed to be important for voters’ assessment dimensions of e-voting systems by use of the Technology Acceptance Model. When investigating e-voting in Switzerland, it is important to firstly give a brief overview of the current legal situation concerning e-voting systems. In Switzerland, electronic voting was introduced in individual cantons for federal votes in 2004 (Federal Chancellery FCh 2018b). Switzerland has two different systems for electronic voting: the system of the Canton of Geneva and a variant of Swiss Post. Currently, eight (out of 26) cantons offer e-voting. Five of the eight cantons allow electronic voting for both Swiss nationals living abroad and for Swiss voters in Switzerland. In three cantons, only Swiss nationals living abroad can vote electronically (Federal Chancellery FCh 2018a, Federal Chancellery FCh 2018b). On 5 April 2017, the Federal Council initiated the next steps for a nationwide introduction of e-voting by deciding to terminate the current pilot phase for e-voting soon in order to transfer the legislative work to regular operation. With a revision of the legal basis, e-voting is to be established as a third, regular voting channel alongside postal and personal voting at the ballot box (Federal Chancellery FCh 2018b). The Confederation and the cantons work closely together in the field of e-voting. Based on the Federal Constitution of the Swiss Confederation, the Confederation regulates the exercise of political rights in federal matters (Art. 39, BV 1999). The cantons are responsible for the execution of federal voting and issue the necessary ordinances. Accordingly, the cantons remain responsible for the input and implementation of e-voting and are the actual project managers. The Federal Chancellery supports them in their introduction to legal, organisational and technical matters and coordinates the projects at national level (Federal Chancellery FCh 2018a). The overall theoretical framework applied in this paper consists of the Technology Acceptance Model proposed by Davis (1985, 1989), which was applied by numerous scholars and represents one of the most famous heuristic models in this regard (Carter & Bélanger 2005; Horst, Kuttschreuter & Gutteling 2007; Hung, Chang & Yu 2006). Although the model stems from the 80s, several implications of the model remain valid even today. Generally speaking, the TAM aims to answer the question why people use or do not use a technology. Thus, we transfer the assumptions developed within the TAM to e-voting systems. Davis (1985) argues that “a potential user’s overall attitude toward using a given system is hypothesized to be a major determinant of whether or not he actually uses it. Attitude toward using, in turn, is a function of two major beliefs: perceived usefulness and perceived ease of use.” (Davis 1985: 24). Following previous studies, we argue that the TAM assumptions can be applied to e-government services in general (see e.g. Horst et al. 2007) and e-voting in detail. In addition to the perceived usefulness and the ease of use, scholars repeatedly revealed that trust represents an additional factor that should be taken into account when introducing new technologies in the context of e-government (see e.g. Abu-Shanab 2014; Carter & Bélanger 2005; Horst et al. 2007; Welch, Hinnant & Moon 2004). In this regard, Warkentin, Gefen, Pavlou, and Rose (2002) claim that citizen trust is crucial for e-government to succeed. Hence, they propose that citizen trust is “an important catalyst of e-Government adoption” (Warkentin et al. 2002: 157). 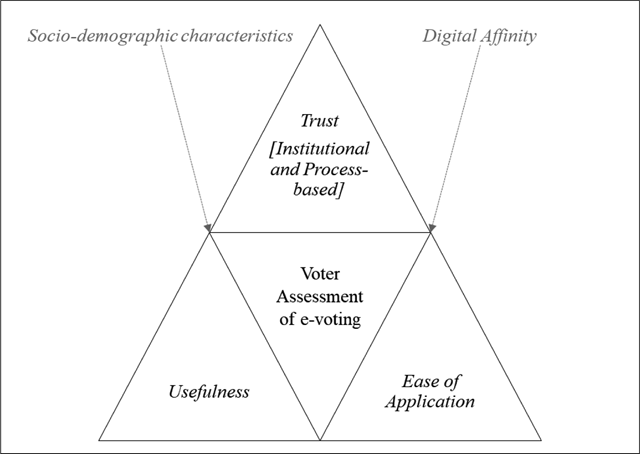 Derived from these theoretical considerations, we distinguish three dimensions in order to tackle voter assessment of e-voting systems: First usefulness, second ease of use and third trust. In addition to these dimensions, socio-demographic characteristics as well as digital affinity were included as control variables. The schematic model of the dimensions influencing voter assessment of e-voting systems is shown in Figure 1. Schematic Model of Assessment Dimensions of e-voting systems by voters. The dimension usefulness measures whether e-voting systems are perceived as useful by voters or not. Usefulness refers to the perceived degree of usefulness through users to “believe that a particular system facilitates their activity” (Warkentin et al. 2002: 161). The perceived usefulness can be defined straight forwardly as capturing “the actual usefulness of online government services” (Carter & Bélanger 2005: 10). Karahanna and Straub (1999: 238) define perceived usefulness as a “degree to which a person believes that use of a system would improve his or her performance”. The dimension ease of use measures the assessment of the handling of e-voting systems through voters (Carter & Bélanger 2005; Davis 1985, 1989). It can be defined as “the degree to which a person believes that using a particular system would be effortless” (Karahanna & Straub 1999: 238). The dimension trust can be divided into institutional trust and process-based trust. While the former captures the trust in political institutions such as an independent judicial system, the latter addresses trust in processes enabling e-voting systems (Pavlou 2003; see also Warkentin et al. 2002: 157). Pavlou (2003: 106) defines trust as “a defining feature of most economic and social interactions in which uncertainty is present”, which “has long been regarded as a catalyst in consumer-marketer relationships because it provides expectations of successful transactions”. Along similar lines, Warkentin et al. (2002: 157) claim that institution-based trust represents “the major tactic to build trust in e-Government”. In addition to the three dimensions influencing voter assessment of e-voting systems, we also controlled for the socio-demographic characteristics age, gender, language and education as well as for voters’ digital affinity, since these factors are assumed to also affect voters’ use and therefore assessment of e-voting systems. The data was collected by means of an online survey among Swiss citizens living abroad in November 2017. The survey was distributed via different online channels of the Organisation of the Swiss Abroad (ASO). More precisely, the ASO published the link to the survey on both their webpage and their Facebook page. Additionally, the survey link was distributed via the ASO’s twitter account and a newsletter sent by the ASO to their members. The questionnaire was available in German, French and English. The questionnaire consisted of 34 questions in total, covering the different thematic blocs presented in the theoretical framework. In total, the questionnaire was accessed 1,021 times. After excluding all missing data and non-responses, the final data set consists of a total of 596 respondents. In the following paragraph, results are presented by starting with an overview of socio-demographic characteristics of the respondents, before turning to findings on the three dimensions for measuring respondents’ assessment of e-voting systems. In addition to the closed questions, the questionnaire contained an open-ended question where respondents were asked whether they had additional comments concerning e-voting systems. In total, 189 people provided feedback in the open-ended question. Several responses addressed problems they faced when trying to make use of voting from abroad in general or e-voting systems in particular. Overall, the responses can be assigned to different thematic categories. Hence, the open-ended responses will be presented in the respective context of the results’ discussion. Regarding the language, 65% chose a German questionnaire, 24% a French and 12% an English questionnaire (N = 596).2 Within the sample, male respondents were overrepresented as 62% were male compared to 38% female respondents (N = 592). The overrepresentation of male respondents is even more evident against the background that according to official figures from the Swiss Federal Statistical Office, the proportion of women living abroad was around 54% in 2017 (FSO 2017). The respondents lived in 90 different countries. The most common countries of residence were France with 12% and Germany with 11%, followed by the USA (7%) and the UK, Spain, Canada with 5% each and Italy (4%) (N = 552). The order of the first two countries is in line with the data from the Swiss Federal Statistical Office: Accordingly, around 26% of all Swiss nationals living abroad lived in France in 2017 or in one of its overseas territories. Around 12% lived in Germany, followed by 11% in the USA and 7% in Italy. Moreover, 5% of the respondents lived in each, the UK and in Canada (FSO 2017). With regard to the age of the respondents, Table 1 contains the age distributions in different age groups and reveals a relatively high average age of the respondents: Three quarters of the respondents were 50 or older (N = 445). The official data provided by the Swiss Federal Statistical Office reveals that in 2017, 58% of the Swiss nationals living abroad were 18–64 years of age and 21% 65 years or older (FSO 2017). Education and highest educational qualification of respondents. Before investigating participants’ willingness to make use of e-voting systems, the questionnaire contained questions asking about the voting behaviour in general and the experience with e-voting systems in particular. Regarding the former aspect, 87% of the respondents stated to have participated in Swiss polls and elections while 13% did not (N = 595). In order to investigate the willingness to use e-voting systems, an estimation of the overall digital affinity of respondents is required. In order to tackle the respondents’ digital affinity, they were firstly asked whether they make use of online services in general, which was affirmed by 96% of the respondents, whereas 4% stated to not use online services in general (N = 594). The questionnaire also asked for the use of e-government services. Accordingly, three quarters use e-government services, while one quarter does not (N = 591). Also essential in this context are respondents’ experiences with e-voting systems. Overall, 60% of the respondents stated that they had already voted by means of e-voting or tested an e-voting system, while 40% did not (N = 595). In total, 47% of the responses already voted by e-voting or tested an e-voting system, while 53% did not (N = 595). Concerning the willingness to make use of e-voting systems, respondents were asked to rate their willingness to use e-voting systems on a scale between 1 (= very low) to 7 (= very high). We then recoded the willingness to a dichotomous variable, consisting of willingness to make use of e-voting systems and no willingness to use e-voting systems. The result showed that a majority of respondents were willing to make use of e-voting systems: 97% stated they would be willing to use e-voting systems, while 3% were not (N = 272). One crucial aspect when investigating voters’ assessment of e-voting systems consists in voters’ trust. As discussed in the theoretical section of this paper, the concept of trust can be divided into institutional trust and process-based trust. The questionnaire contained four items capturing institutional trust and three items capturing process-based trust. On a scale between 1 (= entirely disagree) and 7 (= entirely agree), respondents were asked to indicate their approval of seven statements. Table 2 shows the means, standard deviations and total sample sizes for each statement, divided in process-based trust and institutional trust. Approval of statements dealing with institutional trust and trust in e-voting systems. Note: Scale represents the degree of respondents’ approval to statements on a scale between 1 (= entirely disagree) and 7 (= entirely agree). Results reveal an overall high level of trust among the respondents, even though the average institutional trust seems to be slightly higher than the average process-based trust. Regarding intuitional trust, the highest average approval was recorded by the statement “The regulation of e-voting systems through the Swiss state is important for me” (M = 6.3, S.D. = 1.0, N = 591). The lowest average approval was recorded by the statement “I consider the Internet as a secure environment for e-voting”, although an average approval of 5.7 is still relatively high (S.D. = 1.3, N = 592) (see Table 2). Concerning process-based trust, the highest average approval was given by the respondents concerning the statement “E-Government simplifies the bureaucratic processes” (M = 6.0, S.D. = 1.4, N = 574) and the lowest average approval was recorded by the statement “Through my experience with e-government, I have more confidence in e-voting” (M = 5.2, S.D. = 1.6, N = 570). In order to test whether trust plays a role regarding the willingness to make use of e-voting systems, we computed Pearson product-moment correlation coefficients. As shown in Table 3, there was a positive significant relationship between all variables measuring institutional trust as well as variables capturing process-based trust. Hence, increases in (institutional or process-based) trust correlated with increases in the willingness to make use of e-voting systems. Correlations between trust and willingness to make use of e-voting systems. Note: * p < .05, ** p < .01, *** p < .001, two tailed. r = Pearson product-moment correlation coefficient. The perceived usefulness of e-voting systems was captured by asking the respondents to rate the usefulness on a scale between “entirely disagree” (= 1) and “entirely agree” (= 7). 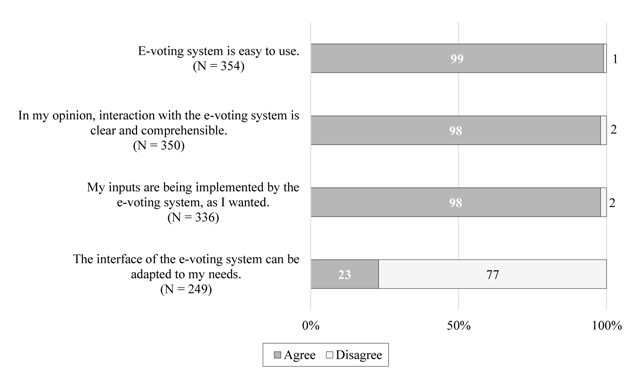 The high degree of perceived usefulness of e-voting systems among the respondents is shown in Figure 2. Accordingly, 85% of the respondents entirely agreed and all respondents apart from 1% at least somewhat agreed with the statement “I think e-voting is useful” (M = 6.8, S.D. = 0.7, N = 356). Agreement with the statement that e-voting is useful. Note: Bars represent percentages, N = 356. In addition, the perceived usefulness was captured by asking participants to rate their agreement to the statement “e-voting simplifies my voting process” on a scale between “entirely disagree” (= 1) and “entirely agree” (= 7). The statement received an average agreement of 6.7 (S.D. = 0.8, N = 355) and therefore indicates a very high degree of perceived simplification of e-voting systems among the respondents. In order to assess the relationship between perceived usefulness and willingness to make use of e-voting systems, Pearson product-moment correlations were calculated, and the results are shown in Table 4. There was a positive relationship between factors capturing the perceived usefulness and the willingness to make use of e-voting systems, which was statistically significant. Correlations between perceived usefulness and willingness to make use of e-voting systems. In order to examine the assessment of e-voting systems, we excluded those respondents from the survey who stated to have no experience with e-voting systems. In total, 60% of the responses already voted by e-voting or tested an e-voting system, while 40% did not (N = 595). The responses on a seven-level scale were recoded to dichotomous variables, consisting of agreement and disagreement concerning statements with regard to the ease of handling of e-voting systems. The results are presented in Figure 3. Perceived ease of use of e-voting systems. The handling was perceived as being simple by most of the respondents who had already made use of e-voting systems or tested them. Accordingly, 98% rather or strongly agreed with the statement “I think the e-voting system is easy to handle” whereas 1% did rather or entirely disagree and 1% stated to be indifferent (N = 359). The perceived use of e-voting systems was measured by three additional statements, which are also shown in Figure 3. Accordingly, 98% of the respondents agreed with the statements “In my opinion, interaction with the e-voting system is clear and comprehensible”5 (N = 350) and “My inputs are being implemented by the e-voting system, as I wanted” (N = 336). In contrast, 77% disagreed with the statement “The interface of the e-voting system can be adapted to my needs” (N = 249).6 An explanation for the lower agreement with the latter statement consists in the provided clarification stating that an example for the adoption of needs consists in the possibility to change the language. Since within the e-voting procedure, documents are only provided in a limited number of languages, it might be that Swiss citizens living abroad have difficulties understanding the documents if they speak none of the official languages in Switzerland nor English. In order to determine the relationship between ease of use and willingness to make use of e-voting systems, Pearson product-moment correlations were calculated. As shown in Table 5, results revealed a positive and significant correlation between the perceived ease of use and willingness to make use of e-voting systems. Correlations between ease of use and willingness to make use of e-voting systems. The aim of this paper was to shed light on the use and assessment of political e-participation in Switzerland by focusing on one central target group of e-voting, namely Swiss nationals living abroad. The data was collected by means of an online-survey, and the final sample comprised a total 596 Swiss citizens living abroad. Results of this study provide a new insight into attitudes and preferences towards e-voting systems of the users themselves. The theoretical framework combined implications of the Technology Acceptance Model (TAM) with considerations about the importance of trust for voters’ use of new technologies. Findings yield a highly positive attitude towards e-voting from potential users. This applies to the e-voting system itself (handling etc.) but also to the legal and procedural framework provided by the state. Another important finding addresses the perceived relevance of data security. Although the findings in the closed-questions dealing with trust in e-voting systems did not point in this direction, the responses to open-ended questions indicate that data security seems to be of high importance for potential users of e-voting systems. The study contains some limitations that should be considered for the results’ interpretations. First, the data was collected by means of an online-survey. Thus, it is likely that the data suffers from self-selection to some extent because only people who are familiar with handling online surveys were able to participate. Another limitation is due to a skewed data structure concerning socio-demographic characteristics, caused by an overrepresentation of highly educated, older men. Finally, while the sample consisting of Swiss nationals living abroad provides some advantages, it could be the case that some of the respondents lived abroad for so long that they do not feel connected to Switzerland anymore. In this context, some open-ended responses contained an explanation as to why they do not vote in Switzerland, for example: “I am no longer voting in Switzerland because I am no longer close to what is happening. I don’t see why I should make life difficult for the people who live there.” However, when running a chi-square test in order to estimate whether there was a significant relationship between having more than one citizenship and voting frequency (measured as a dichotomous variable for having voted within the last two years), the results revealed no evidence of a significant relationship (X2 = 0.28, N = 593, p = 0.867). Future research could benefit from investigating the assessment of e-voting systems among domestic voters in order to be able to compare the e-voting assessments of different target groups. In addition, further research should investigate the relevance of perceived data security for users’ evaluation of e-voting systems in more depth. 1We thank Nadine Wenzinger, Jean-Luc Hofer and Diego Heinen for their support with the data collection. 2All results presented in this paper were rounded to whole numbers (despite p-values, means and standard deviations). 3The data of the Swiss Federal Statistical Office concerning Swiss nationals living abroad does not contain information on the educational levels thus no comparison can be made between the survey sample and the official data. 4r = Pearson’s product-moment correlation (two-tailed); rpb = Point-Biserial Correlation (two-tailed). Braun, N., Buchsbaum, T., Krimmer, R., & Prosser, A. (2004). E-Democracy und E-Voting für Auslandsbürger: Arbeitspapiere zum Tätigkeitsfeld Informationsverarbeitung und Informationswirtschaft. (3). BV. (1999). Federal Constitution of the Swiss Confederation. Davis, F. D. (1985). A technology acceptance model for empirically testing new end-user information systems: Theory and results. Massachusetts Institute of Technology. Federal Chancellery FCh. (2018a). Faktenblatt, Vote électronique. Retrieved from: https://www.bk.admin.ch/dam/bk-intra/de/dokumente_alt/2017/04/e-voting_faktenblatt.pdf.download.pdf/e-voting_faktenblatt.pdf [Last retrieved on 22.02.2018]. Federal Chancellery FCh. (2018b). Vote électronique. Retrieved from: https://www.bk.admin.ch/bk/de/home/politische-rechte/e-voting.html [Last retrieved on 21.02.2018]. FSO, F. S. O. (2017). Auslandschweizer im Jahr 2017. Retrieved from: https://www.bfs.admin.ch/bfs/de/home/aktuell/neue-veroeffentlichungen.assetdetail.4883813.html. FSO, F. S. O. (2018). Auslandschweizer. Retrieved from: https://www.bfs.admin.ch/bfs/de/home/statistiken/bevoelkerung/stand-entwicklung/auslandschweizer.html [Last retrieved on 21.02.2018].